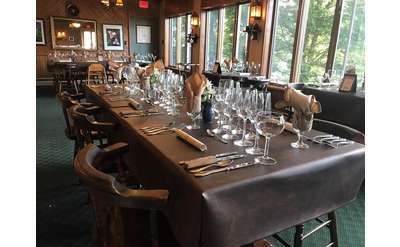 In the Adirondacks, there are a range of dining options, from casual to formal, all set amid the natural beauty of the six-million acre park. You can enjoy a romantic evening for two under the stars, or enjoy a night out with the whole family. The cuisine is varied and reflects the cultural influence of the area's many visitors and residents. Enjoy delicious food, friendly ambiance and extraordinary Adirondack cuisine at any one of the establishments listed below. Featuring a waterfront dining room and a rustic and cozy tavern, The Big Moose Inn Restaurant & Tavern offers guests both casual and fine dining experiences at their Adirondack establishment in Eagle Bay, NY. Are you looking for a side of history with your lunch or dinner? Book a table at the historic Adirondack Hotel on Long Lake for delicious American fare and 19th century ambience. The Lake View Cafe at the Adirondack Experience is open during the summer season and offers fresh, homemade salads, artisan sandwiches, and more! Sticks & Stones in Schroon Lake, NY is a casual dining restaurant in the Adirondacks featuring delicious food, a full bar, and a warm, inviting atmosphere. Have an Adirondack wedding to remember at The Hungry Trout in Wilmington, only a short drive away from Lake Placid. Enjoy views of Whiteface Mountain and some of the most delicious food in the North Country! If you've been dreaming of dining at a Parisian sidewalk cafe, head over to Saranac Lake and the Left Bank Cafe! You can even bring your pets to dine on the waterfront patio while you enjoy the views and delicious French food. Located in the heart of Chestertown, NY, The Bullhouse is serving up Latin American cuisine in a casual yet upscale setting. Their menus include tasty tapas and appetizers, seafood, steaks, and great craft beers from the region. Do you need a delicious breakfast before you head out on the lake or into the mountains? What about a hearty sandwich for your pack or a wholesome dinner? Head to the Lakeview Deli in Saranac Lake! If you're looking for classic, hearty Italian food, head on over to Billy's Italian Restaurant in Old Forge NY! Serving favorites like spaghetti and baked ziti alongside house specialties like Haddock Francese, everyone will find something to enjoy! Located at the Panther Mountain Inn in Chestertown, NY, Panther Mountain Pub specializes in all your pub food favorites and pizza. They also offer live music entertainment and a wide selection of craft beers at the bar. Basil & Wicks is a restaurant and bar in North Creek NY, not far from popular ski mountains, hiking, and kayaking. Stop in for good, hearty fare and a nice cold glass of beer! DeCesare's Pizzeria in Schroon Lake, NY has been serving great food since 1978. They offer a variety of gourmet and specialty pizzas, as well as Italian food, BBQ, and more. Stop into Noon Mark Diner for breakfast, lunch, or dinner. Serving classic diner foods, Noon Mark Diner is a throwback in all the best ways. Next time you're in the High Peaks, make sure you plan to eat here! Stop by Flanagan's Pub & Grill in Schroon Lake for a casual family dining experience. The restaurant features a lunch and dinner menu, a full bar, and more! 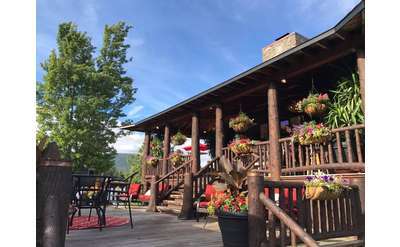 Whether you're a local or a visitor, you will love the Indian Lake Restaurant and Tavern. Serving classic American dishes, this central Adirondacks restaurant is a must-dine for hikers, paddlers, and leaf peepers. For tasty icy treats, great food, and more, visit the Main Street Ice Cream Parlor & Restaurant in Chestertown, NY. The ice cream shop features an old-fashioned setting that is comfortable and nostalgic. A hidden gem of the Adriondacks, this small restaurant in Old Forge NY is a favorite among locals and visitors to the region. Serving fresh, local food, Five Corner's Cafe is a must-eat in the Adirondacks! This deli, market, and restaurant in Tupper Lake serves fresh breakfast, lunch and dinner. The restaurant offers homemade soups and salads, artisan sandwiches, and daily specials that you can eat there or take home!